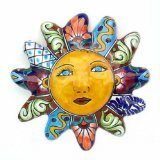 If you need some Mexican home decor that will brighten up your room these cheery wall pieces are sure to set your Mexican themed home. The adorable butterfly wall piece above is made of ceramic. It is approximately 10" tall and 10" wide. This picture shown is one particular style, be aware that you may receive a different color pattern because each of these pieces are hand painted! This piece was hand painted in Mexico and each one has a hole in the back for hanging. Each Mexican home decor butterfly piece of wall art is unique. This pretty dragonfly is hand painted in Mexico, so each piece is also unique. It measures roughly 9" wide. Because it is painted by hand, each piece is unique and no one piece is exactly alike. 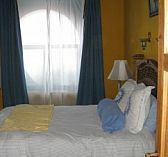 Your piece will vary in color and pattern. This whimsical little frog measures approx 1" tall, 6" long and 5" wide! It is made of ceramic and hand painted in Mexico. Since this product is painted by hand, the one that you receive will not be identical. No two pieces are exactly alike. 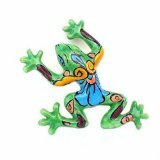 This little frog has a hole in the back for mounting on your wall and will make a wonderful addition to your Mexican themed home! 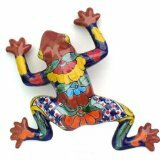 This Talavera frog will look great hanging on a wall or sitting near a garden pot! This little guy measures approx 2" tall, 12" long and is 11" wide. It is hand painted in Mexico and comes with a hole in the back for mounting. Since this product is hand painted, the color and patterns will vary (no two pieces are exactly alike), yours will not look the same.